My Life In Neon | The “Your Enemies Don’t Have To Die For You To Win” Game Jam! You don’t need to sign up. Just create! 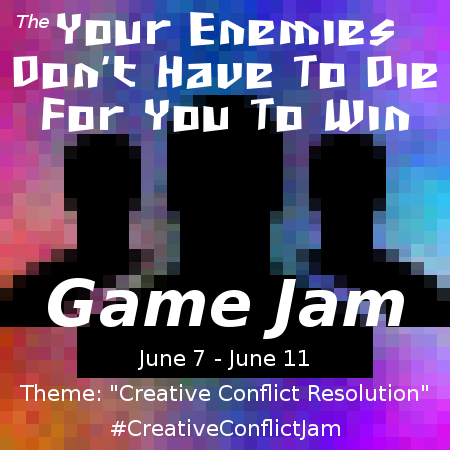 Share or Reblog using the #CreativeConflictJam tag on twitter and tumblr. If you need hosting space, you can find my email address on my contact page. The Dates: June 7 – June 11. The Tools: Anything you want. TwineHub is a great place to start if you’re interested in playing and making Twine games. Its resources section is really helpful. If you want a good starting place, definitely check out Anna Anthropy’s Twine tutorial. Leon Arnott’s blog has some fabulous Twine scripts as well to add a little extra functionality, as well as easy to tweak CSS. Ren’Py is a great visual novel engine, and it has a pretty good Quickstart guide on the website. If you want to do more complicated things or just make your game a little jazzier, I’m really fond of the Cookbook as well. Need some music or sound effects? Try nosoapradio.us or Freesound! Need art or fonts? Try Openclipart and Lost Type! Yes, you can use concepts and artwork you’ve made in the past as a starting point! The Why: Doom gave us conveniently inhuman, mindless hordes of monsters to kill. Wolfenstein 3D gave us hordes of mindless Nazis to kill, as though the average soldier weren’t human. Deus Ex made us choose between violence or stealth, and to Human Revolution‘s credit, there was the moral nudge of more XP for non-lethal “takedowns”. In CounterStrike the only way to deal with terrorists is to kill them, because their ideology is inherently evil and wrong, right? Bioshock and Spec Ops: The Line tried in vain to tell us violence and obedience are a choice while only allowing the player to kill to reach the end. Even JRPGs have elaborate combat modes. Their tabletop RPG cousins like Dungeons & Dragons focus almost exclusively on combat, even when stats are nominally available for conflict resolution without it. In Anita Sarkeesian’s latest video, Tropes Vs Women: Damsels in Distress pt 2, she takes aim at the way developers box themselves into a corner by making combat the core mechanic: keep swinging that hammer because this level is just full of nails. Why do games make us kill the bad guy before we can call it winning? 3 Responses to The “Your Enemies Don’t Have To Die For You To Win” Game Jam!